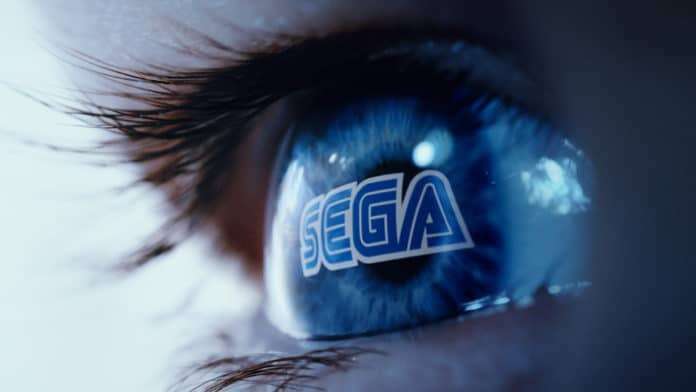 Sega Sammy has released their “Fiscal Year Ending March 2018 2nd Quarter Results Presentation” today, and it includes a section dedicated to the future outlook of the company in terms of business decisions. 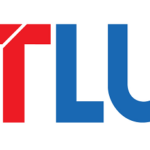 “Improving localization quality (along with strengthening cooperation with Atlus USA). Promoting global development at an early stage. 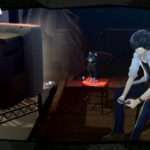 The goal to improve localization that Sega Sammy has outlined potentially ties into the reception for this aspect of Persona 5, as well as previous events like untranslated Japanese text in Shin Megami Tensei IV: Apocalypse. 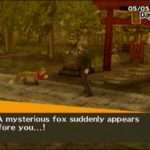 Justin Massongill: Do you get to play through the whole game in its original form—you know, whatever build is available—and that way you have a good idea of what the characters are like, if there are any big twists along the way—you know how to write to those and all that or…? 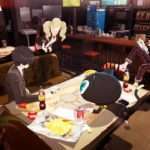 Mai Namba: I would want to say if we were in a perfect world that would be the case but, with a game as big as Persona 5, a lot of times the game is still in development. 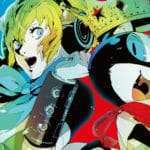 So we will get the assets from Japan, and we will try to make use of that as much as possible, try to figure out all the characters, and then work from there. If we’re lucky we’ll get a full enough build that we can actually play through and get a full grasp of it, but that doesn’t necessarily happen all the time, unfortunately. 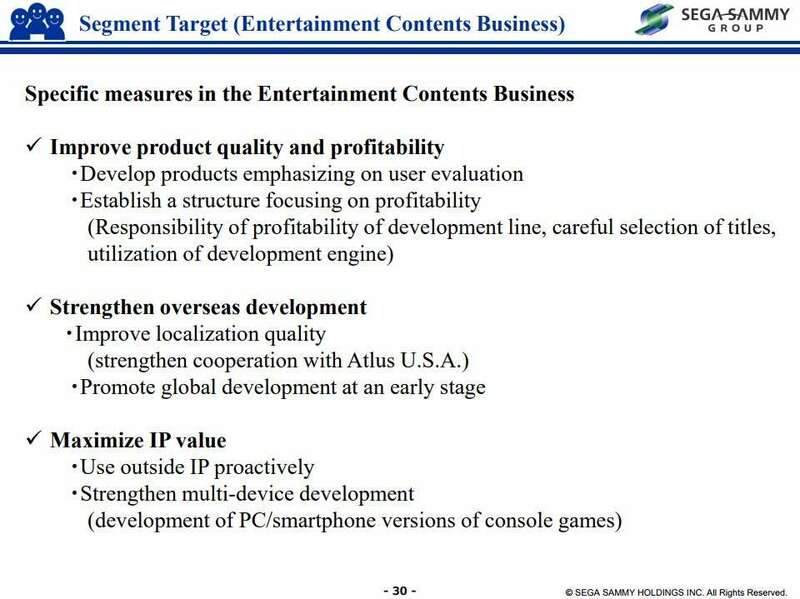 The second part of the goal to “strengthen overseas development” involves promoting global development at an early stage, which would mean English localization for Sega’s Japanese games happening earlier in their development process. 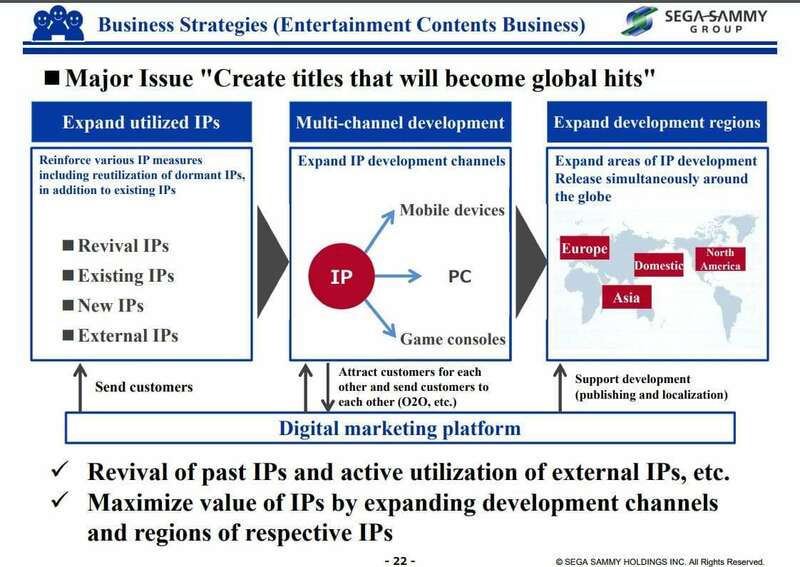 This could also tie into Sega’s desire to emphasize “global hits” and lead to closer release gaps between Japan and overseas, outlined in their “Road to 2020” business presentation, from May 2017. 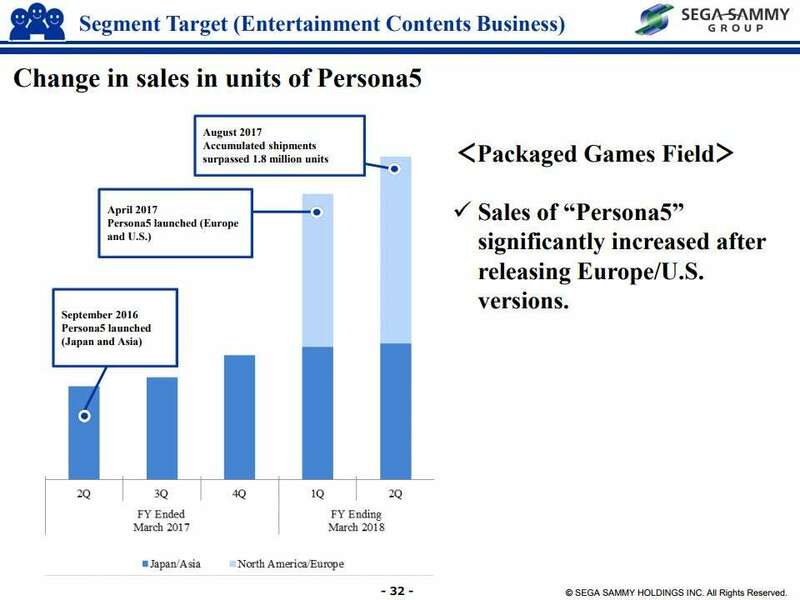 As part of the financial presentation, Sega Sammy showed a graph of Persona 5‘s sales, which increased significantly after its international release, reaching 1.8 million shipped copies in August 2017.